Our training methods are based on the science of animal behaviour and learning theory. We offer one-on-one sessions in the client's home or in our training center in Montague, MA. Our group classes are small so we can more effectively give each human/dog team the attention they need to succeed in their training goals. Canine Head Start is located in Montague, MA on 55 acres. Classes are held at our 1600 square foot, climate controlled indoor training facility and the surrounding woods and trails. Come join us and train in this beautiful setting. Elise specializes in the prevention and treatment of behaviour problems in dogs. 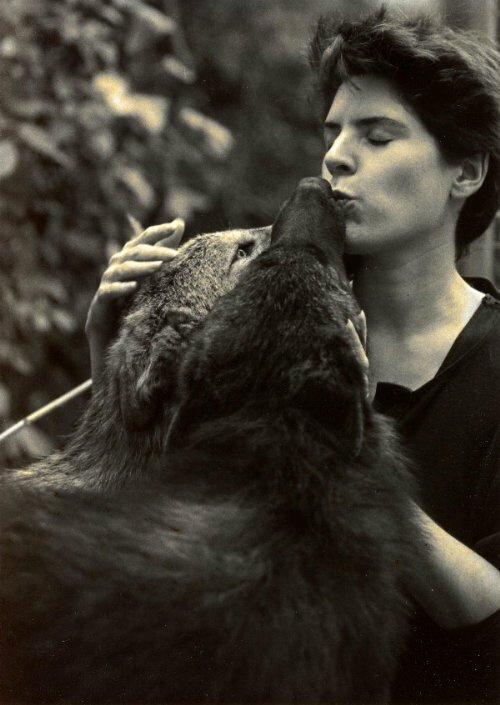 She has been working in animal behaviour with both domestic and wild canids since the early 1990s. Her work has included projects on a number of captive and wild canids including Darwin's foxes in Chile, crab-eating foxes in Venezuela, African wild dogs at the Philadelphia Zoological Garden, and grey wolves at Wolf Park, Battle Ground, IN. In 1991, Elise began working with domestic dogs in Philadelphia, PA where she worked at the Veterinary Hospital at the University of Pennsylvania in the Behaviour Clinic. She held a position there for 2 years during which she co-developed a Puppy Problem Prevention Program with Lois Hall and Dr. Karen Overall. During this time Elise was also studying Animal Behaviour and Learning Theory at the University of Pennsylvania, as well as working with well known author and behaviourist, Steve Lindsay. Prior to moving to Massachusetts where she pursues her Ph.D. in Animal Behaviour, Elise worked as an animal behaviour consultant in Philadelphia, PA. Since 1996 Elise has been located in Montage, MA. After completing her fieldwork on Chilean foxes, she opened her training center and began providing group classes, as well as individual evaluations and one-on-one training sessions. Elise believes that a solid knowledge of animal behaviour and learning theory are the fundamental tools for helping humans and dogs to live happily together. Her work is based on positive reinforcement and behaviour modification training. 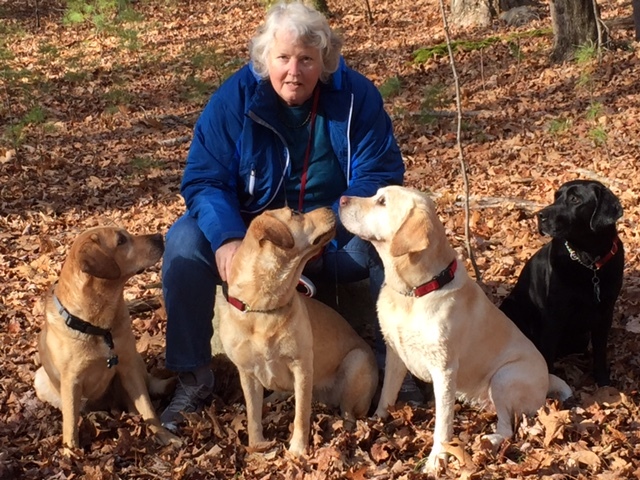 Susan has been training dogs for competition since 1990, working in obedience, rally, and tracking. She currently has three labrador retrievers, Gilly who is 12 years old, Nikki who is 6 and Kali who is 3. As she began competition with Gilly, she used “traditional” methods which, while effective, were not engaging for Gilly. Once she learned and employed positive reinforcement and clicker training, at Canine Head Start, Gilly and Susan found real joy in training and competing. As a result, Gilly has earned her CGC, CD in obedience and her RE in rally. Nikki has earned her CGC, and her RA in rally, and has begun tracking. Kali is working on rally, and obedience and has been clicker trained since puppyhood. 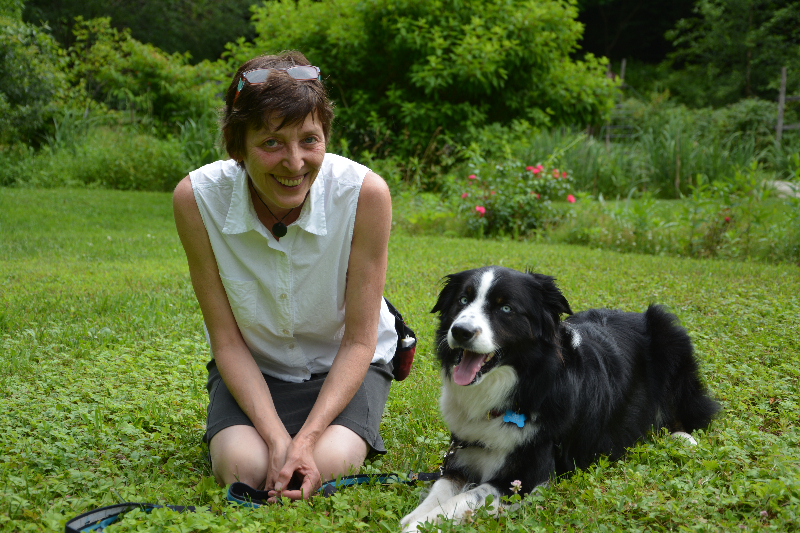 Most recently, Susan completed the dog training professional course offered by Karen Pryor Academy and has become a KPA-CPT (or certified professional trainer). All of Susan’s dogs love working and she loves working with them. It is this joy of training that motivates her to teach others the foundational knowledge of positive reinforcement and clicker training. 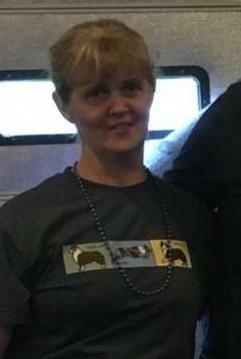 Susan is a CGC evaluator. Lottie has been training horses and dogs for many years, attending Clicker Expos and other seminar and workshop regularly. She recently completed the rigorous KPA Professional Dog Trainers course and obtained her KPA-CDTP certification. Lottie is dedicated to training owners how to successfully train their animals using force free, science based methodology. Noah has had a lifelong love and fascination with animals of all kinds but what he really loves about dogs is the incredible connection that humans can have with them. He finds it amazing that we can share our lives with these animals that truly love us back and want to live with us just as much as we want to live with them. He first discovered this amazing bond after adopting his first dog. Lou, thought to be a Brittany Spaniel and Border Collie mix, was adopted at five months old and went fully blind within a number of months. This disability strengthened their bond. 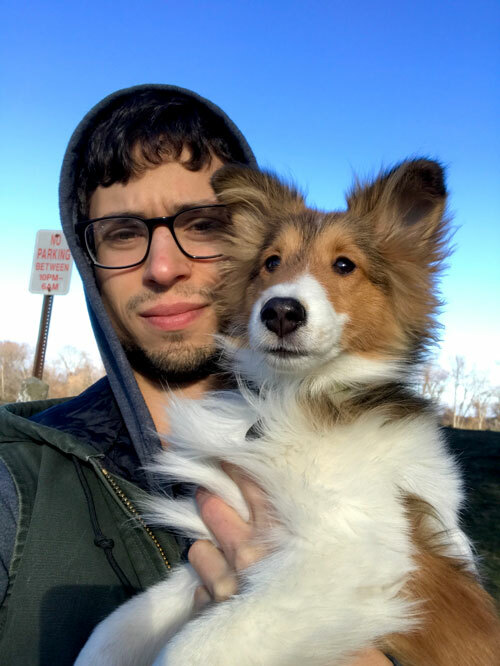 Noah’s real interest in formal training started after welcoming his second dog into the family, Obi, a Shetland Sheepdog who wants to chase anything that moves! A well-trained dog makes for both a happy dog and a happy human. This is Noah’s biggest goal as a trainer, to help people to live comfortably with their dogs with as little stress as possible. He wants to help people to understand their dogs better and increase their level of communication, helping to turn them into reliable and trustworthy companions. After many dog-less years, at last the time was right for having a dog in my life again. Preparing for rearing a puppy, I discovered the world of dog training based on science, positive reinforcement and relationship building. I was fascinated by the research that has dramatically changed our understanding of dogs and what makes them tick. Raising Mattie, my wonderful Australian Shepherd, wasn’t quite as unencumbered, however, as I had imagined. Instead, he set me off on a steep learning curve. Mattie turned out to be a sensitive and shy puppy. His timidity expresses as reactivity to strangers and has presented us with some challenges. Trying to figure out how to help us cope more effectively put me on a journey to better understand dog behavior and what makes for a harmonious dog-human relationship. It also made me keenly interested in helping others sort out common challenges of communication, build relationships of mutual respect and trust, and help their dogs be happy, well-adjusted family members. Another step in the journey, I am excited to join the team at Canine Head Start. Before beginning my internship, most of my experience working with dogs came from fostering and training service dogs. While attending UMass Amherst, where I studied animal behavior, I spent my last two years raising a puppy to be a psychiatric SD. My involvement in the training process sparked a fascination with the unique human-dog partnership that can be developed through careful communication and mutual respect (and dog treats). I recently adopted a young collie mix, and have learned that there is no limit to the amount of patience needed to work through behavioral challenges. One of my largest hurdles has been developing a way of encouraging extended periods of relaxation because Jinx appears to have no Off switch, and sometimes I enjoy sitting undisturbed.